Jordan Rudess (born Jordan Charles Rudes; November 4, 1956) is an American keyboardist and composer best known as a member of the progressive metal/rock band Dream Theater and the progressive rock supergroup Liquid Tension Experiment. Jordan Rudess was born in 1956 into a Jewish family. He was recognized by his 2nd grade teacher for his piano playing and was immediately given professional instruction. At nine, he entered the Juilliard School of Music Pre-College Division for classical piano training, but by his late teens he had grown increasingly interested in synthesizers and progressive rock music. Against the counsel of his parents and tutors, he turned away from classical piano and tried his hand as a solo progressive rock keyboardist. When Bleu Ocean was assembling a team of fellow drummers to perform on the song "Bring the Boys Back Home", featured at Pink Floyd's The Wall, he invited Rudess for the session, since the keyboardist had been playing drums for a while. However, Rudess's performance was rejected by producer Bob Ezrin. At that time, Rudess had already chosen the keyboards as his main instrument. Rudess was part of a studio project assembled by bubblegum pop impresarios Jerry Kasenetz and Jeffry Katz, the folks behind The Ohio Express and The 1910 Fruitgum Company. In 1980, they tried their hand at album-oriented rock with Speedway Boulevard, which also featured touring members of Ram Jam. The group never performed live, and disbanded shortly after the release of the album. After performing in various projects during the 1980s, he gained international attention in 1994 when he was voted "Best New Talent" in the Keyboard Magazine readers' poll after the release of his Listen solo album. Two of the bands who took notice of Rudess were The Dixie Dregs and Dream Theater, both of whom invited him to join. 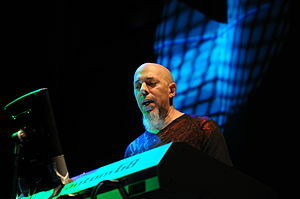 Rudess chose the Dregs, primarily as being a part-time member of the band would have less of an impact on his young family, a choice he was not given with Dream Theater. During his time with the Dregs, Rudess formed a "power duo" with drummer Rod Morgenstein. The genesis of this pairing occurred when a power outage caused all of the Dregs' instruments to fail except Rudess', so he and Morgenstein improvised with each other until power was restored and the concert could continue. The chemistry between the two was so strong during this jam that they decided to perform together on a regular basis (under the name Rudess/Morgenstein Project or later RMP) and have since released a studio and a live record. Rudess encountered Dream Theater once again when he and Morgenstein secured the support slot on one of Dream Theater's North American tours. In 1997, when Mike Portnoy was asked to form a supergroup by Magna Carta Records, Rudess was chosen to fill the keyboardist spot in the band, which also consisted of Tony Levin and Portnoy's Dream Theater colleague John Petrucci. During the recording of Liquid Tension Experiment's two albums it became evident to Portnoy and Petrucci that Rudess was what Dream Theater needed. They asked Rudess to join the band, and when he accepted they released their then-keyboardist Derek Sherinian to make way for him. Rudess has been the full-time keyboardist in Dream Theater since the recording of 1999's Metropolis Pt. 2: Scenes from a Memory. He has recorded nine other studio albums with the group: 2002's Six Degrees of Inner Turbulence, 2003's Train of Thought, 2005's Octavarium, 2007's Systematic Chaos, 2009's Black Clouds & Silver Linings, 2011's A Dramatic Turn of Events, 2013's Dream Theater, 2016's The Astonishing, and 2019's Distance over Time. In addition, he has appeared on the live albums Live Scenes From New York, Live at Budokan, Score, Chaos in Motion, Live at Luna Park and Breaking the Fourth Wall. In addition to working with Dream Theater he occasionally records and performs in other contexts, such as a 2001 one-off duo performance with Petrucci (released as the CD An Evening With John Petrucci and Jordan Rudess), as well as backing up Blackfield on their first short US tour in 2005 and playing a solo opening slot for them on their second in 2007. He also contributed to Steven Wilson's 2011 album, Grace for Drowning. In 2010, Rudess composed "Explorations for Keyboard and Orchestra," his first classical composition. It was premiered in Venezuela on November 19, 2010 by the Chacao Youth Symphony Orchestra and guest conductor Eren Başbuğ. Rudess played all of the keyboard and synthesizer parts. On July 28, 2011, in a poll conducted by MusicRadar, Rudess was voted the best keyboardist of all time. Rudess says his influences as a keyboardist are Keith Emerson, Tony Banks, Rick Wakeman and Patrick Moraz. His favorite musical artists and groups include Gentle Giant, Yes, Genesis, Pink Floyd, Emerson, Lake & Palmer, King Crimson, Jimi Hendrix, Autechre, and Aphex Twin. Rudess appeared on the Ayreon album, The Theory of Everything released on October 28, 2013. While many keyboard players in progressive rock tend towards bringing numerous keyboards on stage, creating large racks of keyboards, Rudess would sample sounds from other keyboards he owned and map them to a single keyboard. Each "setup" assigns different sounds to different layers and key ranges of the keyboard controller; these setups are then arranged in the order they will be required for a gig, and cycled through with a foot-switch. From the 1990s onward, he used a Kurzweil K2600XS during live sets, until switching to Korg's Oasys workstation in 2005, which he first used on Dream Theater's 2005–2006 20th Anniversary tour, along with a Muse Receptor hardware VST and a Haken Continuum X/Y/Z-plane MIDI instrument triggering a Roland V-Synth XT and a synthesizers.com modular unit designed by Richard Lainhart and Roger Arrick. Influenced by Lainhart, Rudess was the first well known keyboardist to bring a Haken Continuum on to a live stage. Rudess still uses the Kurzweil for studio recordings and some of his most well known sounds, such as "the pig", one of his signature sounds which is often played in unison with the guitar or bass guitar, were sounds from the K2600xs. In 2011 Jordan switched from the Oasys to the new flagship Korg Kronos. His current live rig consists of the Kronos together with a Continuum, a lap steel guitar, a Harpejji, and an iPad. Since 2001, Rudess has used custom made rotating keyboard stands on stage for both Dream Theater and his solo career, which are built by Patrick Slaats from the Netherlands. On Dream Theater's 2007–2008 "Chaos in Motion Tour, Rudess expanded his live setup with the addition of a Korg RADIAS, a Manikin Memotron, and a Zen Riffer keytar. Rudess stopped using his Synthesizers.com modular after the European leg of the tour due to its size and weight. Rudess still owns the synthesizer and keeps it in his home studio. During the Progressive Nation 2008 tour, he introduced on the stage a Kaoss Pad 3 for the closing medley. For the 2009–2010 tour, in support of Black Clouds & Silver Linings, Jordan introduced the Apple iPhone on stage, running an application called Bebot Robot Synth. He plays it during A Rite of Passage – both studio album and live versions of the song – and frequently uses it for improvised solos, like in Hollow Years' intro and during a new instrumental section on Solitary Shell. On September 24, 2010, Rudess released the song "Krump," which was an electronica "single" released on iTunes. It featured the use of the new Roland Gaia, Roland's more recent keyboard. In 2010 Rudess started a software company called Wizdom Music. He paired with artists such as Kevin Chartier, Felipe Peña and Eyal Amir (from Project RnL), creating new types of musical instrumental user interfaces and experiences, new and innovative ways of creating sound synthesis, and of recording and performing music, with tablet computers. The company also produced a unique game for learning pitch and chord recognition and an app for real time video effects on a live camera. Geo Synthesizer – a new digital music controller interface, for the iPhone and iPad. Tachyon – app for mixing, morphing and transitioning between two types of sound, for the iPhone and iPad. Leap motion music – a yet to be released touchless music controller by four finger location in 3d, creating music verses according to the fingers' locations, with the Leap Motion controller. HarmonyWiz - an advanced harmonic generator which can create multi-part harmony, all just from inputting a single musical line. You can paint your music in or play it from a piano style keyboard. Jordantron - An app that contains all the sounds of Jordan's live rig into your iPad. This is the first time Jordan Rudess has released a complete set of his exclusive sounds to the public. SketchWiz - turns your camera into your personal sketch artist. You can view your world as pencil, pen, chalk, or charcoal sketches, and you can save your masterpieces to your photo library. EarWizard - Trains your ear while improving your memory skills. Repeat back a sequence of chords which gets longer with each round of play. GeoShred - an app that enables musicians to create mind bending guitar sounds and effects on an iPad. ^ "Nancy Kornfeld Becomes a Bride – New York Times". Nytimes.com. June 26, 1989. Retrieved July 28, 2014. ^ "Get Ready to ROCK! Interview with Jordan Rudess, keyboard player with progressive rock band Dream Theater". Getreadytorock.com. Retrieved July 28, 2014. ^ Ling, Dave (January 4, 2016). "How Jordan Rudess Almost Played On The Wall". Prog. Team Rock. Retrieved January 28, 2016. ^ "Jordan Rudess' contribution to Grace for Drowning – Jordan Rudess' Community Forums". Jordanrudess.com. Archived from the original on April 15, 2012. Retrieved August 4, 2012. ^ Scot Solida (July 27, 2011). "The 27 greatest keyboard players of all time | Jordan Rudess | Tech News". MusicRadar. Retrieved July 28, 2014. ^ "Departures: Richard Lainhart". KeyboardMag. February 7, 2012. Retrieved July 28, 2014. ^ "elektronische Musikmaschinen aus Berlin". manikin electronic. Archived from the original on July 15, 2014. Retrieved July 28, 2014. ^ "Rudess Meets Bebot". YouTube. February 15, 2009. Retrieved July 28, 2014. ^ "About Us". Wizdom Music. Retrieved July 28, 2014. ^ "SampleWiz". Wizdom Music. Retrieved July 28, 2014. ^ "MorphWiz". Wizdom Music. Retrieved July 28, 2014. ^ "Geo Synthesizer". Wizdom Music. Retrieved July 28, 2014. ^ "Tachyon". Wizdom Music. Retrieved July 28, 2014. ^ "Exploring Leap Motion". YouTube. July 24, 2013. Retrieved July 28, 2014. ^ "HarmonyWiz - Wizdom Music". Retrieved May 9, 2015. ^ "Jordantron - Wizdom Music". Retrieved May 9, 2015. ^ "Wizdom Music - Products". Retrieved May 9, 2015. ^ "EarWizard - Wizdom Music". Retrieved May 9, 2015. Wikimedia Commons has media related to Jordan Rudess.